The only problem was that I couldn't actually read two Kindles at once. 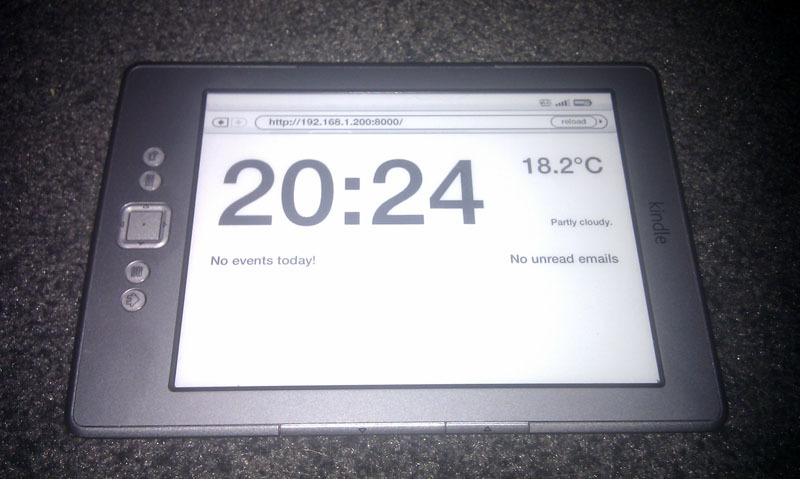 Then I came across a post by Matthew Petroff - Kindle Weather Display. This sparked my curiosity and I decided to build a clock/dashboard with the Wifi - something that'd show things like number of unread emails, weather etc. This appealed to me as the Kindle has fantastic battery life, is silent, and the e-ink display is both large and invisible at night (when I really don't want to know the time). The goal was something I could glance at in the morning before going to work and ignore otherwise. Initially I intended to go down the route of jailbreaking to display an image like Matthew did, but I didn't have any luck with that on my particular device. It then occurred to me that I could just use the built-in web-browser to display a self-updating page. The only blocker to this was stopping the screensaver from turning on, something I was able to work around. The browser chrome was not pretty, but also not a deal-breaker. From then on it was all about building an appropriate web site, serving it (on my desktop, but it'll work on anything running Python) and pointing the Kindle's browser at the right URL. So far, I've managed to show the time (updated on the minute), the current temperature, today's forecast and today's agenda from my Google Calendar. There's nothing magical there and as the site can be displayed on any JS-aware web-browsing device I'm sharing this project on GitHub. It'll change a lot over time but hopefully there are some basics you can use in your own project. Update 05/11/2012: I've now added a count of unread emails in my Gmail inbox so head over to the GitHub repo if you're interested in that sort of functionality for your own project. I've also got server.py working on a Raspberry Pi without modification, and it's perfectly fast enough for my use. Hi do you have any advise how I may get this work with a UK location? I notice that when I change the Lat and Lon co-ordinates, the script errors out when calling the .PY script at line 43. To get more info please visit help-essay.com/buy-dissertation.